Arsenal’s Injuries: Bad Luck or Bad Practice? Well now, some more statistics for us to get our teeth into. Some Arsenal fans have long lamented the apparently never-ending injury list we seem to suffer. There is of course some bias in our opinion about how much we are affected by injuries compared to other clubs, as we notice what happens to our own players more than those elsewhere. On the other hand, any club would notice if a player has missed as much time through injury as the unfortunate Mr Diaby. But are Arsenal’s injury problems really worse than those of other clubs? Is a string of long-term injuries no more than a random occurrence, and it’s just ‘our turn’ to suffer from it for a few years? Any day now we may find everyone is fully fit and stays that way, while Man Utd players are all living in the treatment room – possibly with incurable STDs spread around by a certain Liverpudlian’s poor hygiene and habits with dirty towels – I don’t know, I really couldn’t say and it would be unfair to speculate. It’s very hard to be totally objective on injury lists, because even if you add up all the weeks that players have been out injured at different clubs, do you also have to judge the importance of the player to the club? (Are they a first choice? Not always easy to tell in these days of squad rotation.) And it would be nice to take a view on whether the injury was preventable or not – did it occur in training, in a match, or because the player is a dimwit who poked himself in the ear with a snooker cue on his afternoon off? As usual, we need more data to make a judgement. 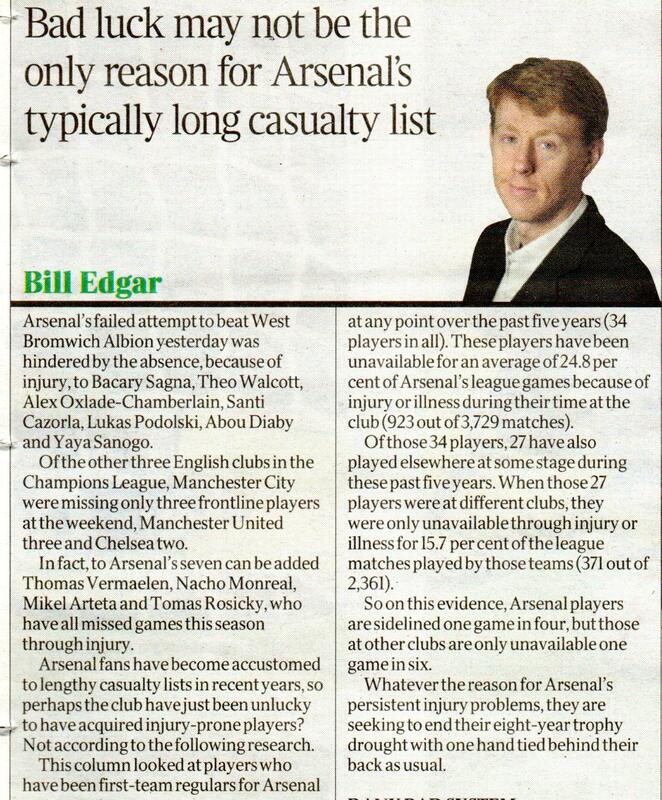 Be that as it may, Bill Edgar in The Times had a go at ‘proving’ whether Arsenal have an inherent problem of what we might call institutionalised injuries by looking at players transferred in and out of Arsenal and their records with Arsenal compared to other clubs. As you can see, his figures show that Arsenal players suffer less from injuries when they’re at other clubs than they do at Arsenal. At least they do in his sample. It’s not a huge difference, though, and no doubt the inclusion of figures for Van Persie, who has been in uncommonly rude health for the last 12 months, have affected it. Not to mention Cesc ‘ooh, me hamstrings’ Fabregas. I’d like to see a breakdown of the figures player by player, personally, as one or two may be skewing it considerably. A few ex-Arsenal players have come out in recent seasons and said that training at Arsenal tends to be ‘softer’ than at other clubs, with full-blooded challenges banned. Does that make it more likely Arsenal players will be injured in matches because they’re not used to the rough stuff, or less likely because they’ve reduced the wear and tear on their bodies? I honestly have no idea. Then again, we do also seem to suffer from injuries picked up in training. I wrote two similar pieces saying the same recently- http://tinyurl.com/pd2aklt and http://wp.me/p2u18B-35 . Got heaps of stick for it, but stats suggest what I said was true. It’s probably not one thing, but a combination of factors. I don’t think it’s to do with the training as such. Henry et al used to train the same way, and they didn’t get anywhere near as many injuries. However, it can be said that the opponents they faced were less fit and so those players had to put in slightly less effort. The problem cannot just be the Arsenal medical team either because players like Rosicky, Van Persie, Diaby etc all had consultations with specialists outside of Arsenal, and it’s not like they were necessarily more effective in dealing with them. Some like Rosicky and Walcott had genetic problems in their hamstring and shoulders respectively so we could also be unlucky with the players we bought. Vermaelen too had some weird ankle problem. However, Arsenal felt it worth their while to invest a hefty sum into building a new medical centre, and are also employing some new conditioning coaches apparently. So they obviously felt the need to improve. To be fair, the injury record improved the last few seasons after a year or so of the GPS system being installed. This year, it’s made a comeback. I don’t know what to make of it. Could just be a quirk. There was also an element of ‘players injuring us’, not so much looking to injure us, but being allowed to get away with excessive physicality and propound ‘Arsenal don’t like it up ’em’ as a defense. No other team has suffered so many broken bones in such a short space of time. These injuries also meant that other players had more burden on them, which might lead to more injuries for them. I also feel there is an element of Arsenal looking after their players too well, whereas other clubs might just load the players with painkillers (or worse) and send them out to play. Reference Hargreaves’ comments on his time at ManU. So, it’s probably very hard to pin down a reason for it, even if you know all the stats and stuff, because there is a lot about the human body that is not understood completely, and every individual is different anyway. Otherwise Arsenal would have fixed it already. Interesting article, however with diaby he had a knee injury then muscular injuries. Sagna two broken legs Ramsey broken bone frimpong ligaments on both knees wilshere ankle. Walcott different injuries vermalean back. If it were all the same injury then I would point at medical team but hernias hamstring and calf muscle along with groin is part and parcel of game and as a game the governing body should be researching if there is any better techniques to lessen chances of suffering these injuries the other injuries happen by accident only the knee ligament damage can be down to turning and twisting knee but they again are just one of those unfortunate injuries. I would hope the team are up to date with all innovations in all sports to reduce injuries or recovery time and doubt Wenger would not insist on this as it was he who introduced player diet and tailoring things to specific players he likes to be on the ball when there is anything that can improve players playing time. If a finger could be pointed it would be at Wenger rushing certain players back diaby wilshere and Walcott all points in case however this season is different we have cover with gnarbry miyiachi chamberlain when fit cazorla same then at push yennaris and bellerin could play on wings. In midfield we have option galore so diaby can be used sparingly and sensibly and rotation will improve his chances of being fit a whole season using him flamini and arteta on a rotation system will keep all fit and healthy hopefully. Wilshere cazorla Ozil can be rotated and used in cam roles think reus or draxler would give us options on wings that leaves cb striker and rb to cover which can be done in January. So in conclusion as a club we are unfortunate with the type of injuries we get sometimes illness can’t be helped. What needs to be looked at are how many hamstring calf groin and knee ankle ligament injuries we suffer compared to other teams are they comparable better or worse and the rates in recovery and recurrence of same injuries better or worse. Most of the players you mention aren’t included in the figures as they haven’t moved clubs in the last five years. This is the abstract. Objective: To study the injury characteristics in professional football and to follow the variation of injury incidence during a match, during a season and over consecutive seasons. Design: Prospective cohort study where teams were followed for seven consecutive seasons. Team medical staff recorded individual player exposure and time-loss injuries from 2001 to 2008. Setting: European professional men’s football. Participants: The first team squads of 23 teams selected by UEFA as belonging to the 50 best European teams. Main outcome measurement: Injury incidence. Results: 4,483 injuries occurred during 566,000 hours of exposure, giving an injury incidence of 8.0 injuries/1,000 hours. The injury incidence during matches was higher than in training (27.5 v 4.1, p<0.0001). A player sustained on average 2.0 injuries per season and a team with typically 25 players can thus expect about 50 injuries each season. The single most common injury subtype was thigh strain, representing 17% of all injuries. Re-injuries constituted 12% of all injuries and they caused longer absences than non re-injuries (24 v 18 days, p<0.0001). The incidence of match injuries showed an increasing injury tendency over time in both the first and second halves (p<0.0001). Traumatic injuries and hamstring strains were more frequent during the competitive season, while overuse injuries were common during the pre- season. Training and match injury incidences were stable over the period with no significant differences between seasons. Conclusions: The training and match injury incidences were stable over seven seasons. The risk of injury increased with time in each half of matches. One factor is players returning from international duty injured. Carzola, Monreal, Sanogo, Rosicky all picked up their latest injuries whilst away. The Walcott/Fabregas/Van Persie/Rosicky were genetic/growth issues and Sagna/Diaby/Ramsey were due to the brutality of others. I believe that we have suffered more breaks by others and as a consequence this throws the stats out of sync along with “unlucky” genetic/growth problems our list appears longer and more troublesome. I do think we tend to keep our players sidelined longer than other teams though. Whether this is “cotton wool” treatment or sound medical practice is a matter of debate but this adds to the stat-quirk that follows us around! Arsenal is probably doing sonethibg wrong when you look at the anount if muscular injuries eg Podolski hamstrings. We have typically used squads that were too small for a club whose manager is as averse to using young players in a pinch, unless they are viewed as potential superstars. That said, if you take Diaby Eduardo and Ramsey out of the equation, I’d be surprised if there was a any difference to other clubs that was statistically significant. When everyone copy and paste the usual topics about transfers and link to Arsenal here there is something refreshing to read . Thanks. My view as an ordinary fan is that injuries are generally speaking part of the game. Medics and in particular those who specialise in muscular and ligaments can shed a bit of explanation. Also it is worth to remember the mental strength of the individual during recovery and after recovery too.Some players can be a type prima donna. Looking back at the lost Villa game Gibbs had a head injury and was hauled off. Had John Terry be in that circumstances I would be surprised to see him replaced. I am not having a go at Gibbs but I do see from the stand that others go that extra mile. Head injuries are nasty yes and I haven’t a clue what was the extent either of Terry or Gibbs . So it leads me to ask if The medics that we have are to soft or balanced or with strong personalities themselves ? I have a military experience and myself wounded layed in bed for months. What I can say is that the I can do it attitude has a vital role in this.But again footballers and soldiers are different world’s cannot be compared easily. But one thing that I am sure is the mental strength of the individual no matter who is plays a role. Point in case Ramsey .Not happy as many the previous season on his performance but what a character. Respect. One can villify Diyaby as much as he/she likes but the man didn’t give up.Hope he will come good and sure he will. First, interesting article, and thanks for the links (and from them on to others), all interesting reading. I think this is down to a complex mixture of factors, some you can control; others you cannot. There are plenty of studies showing the links between fatigue and illness, so fixture congestion, internationals all will have an effect, but beyond that? The idea that the Physio staff are not up to scratch is an option, but I don’t see it staying that way, despite Wenger being overly loyal to his staff as Wenger needs to win so badly. It is still possibly a factor in all this. Others? Fouls come into it, but the stats are meaningless on this. Numbers don’t tell you if a foul is an impact, or the size, and that doesn’t even count the challenges that don’t count in the stats. Worse, Injuries don’t have to be tied to any particular tackle. The club might be looking short term gain; long term pain option at some points, playing someone with a niggle and risking it doesn’t get worse, or rushing someone back out of necessity. That may well have been a factor with us due to squad depth. Players themselves have to factor into it. Quietly carrying niggles, or not being upfront with the medical staff, either for fear of dropping down the pecking order, or just wanting to play. At a club like us, the window of opportunity for a player can be tiny. Denilson gets derided these days, but was looking like our box-to-box man for a while. He damages his back in the 2009-10 season and never makes it back, One injury and his chance is gone. At the other end is Jack, who I think Wenger basically said no matter what he says about a knock, they scan him anyway. Since the Emirates opened we’ve had a lot of younger players, who are more likely to do what he does, whether through, inexperience, a sense of Immortality, or a willingness to take risks. Overall? All of the above, and chose how you weight each factor: Lots of games, players getting kicked (disproportionately? ), medical staff not well dealing with injuries, club putting itself over player recovery, young squad, players under pressure to hold their place…. @Alex, the Terry VS Gibbs argument in terms of a head injury in part would show a positive and proactive attitude on our medical staff — why risk a more serious injury if there is cover on the bench. In terry’s case that wouldn’t be a problem as there is very little to damage. Had a chat some weeks ago with one of the newly appointed academy strength and conditioning coaches. As an. ex international rugby player with a degree in sports science he was able to give me an insight into the subject of developing players. Rugby has seen dramatic changes since the advent of the pro game some fifteen years ago and nowhere have these changes been more apparent than in the area of fitness and conditioning. Gone are the days when running up and down hills doing dozens of press ups and spending hours in the gym in order to increase strength levels. Today its about designing a regime that satisfies two primary criteria , the individual player and the position that player is going to fill on the field. Every team game depends on it’s team members for success and while basic fitness levels are a prerequisite they are by no means the final seat of success. In rugby once a players suitability for a particular position has been identified a regime will be designed for him and him alone. He will learn all about his position on the field , what is expected of him , his physical and mental weaknesses will be addressed . No stone will be left unturned in order to make him the best player he can be. This approach to individual development means that young players are fitter stronger and properly prepared for the very physical battles ahead. One of the biggest pluses that is gained from such regimes is the big reduction in serious and long term injuries. Of course the best preperation does not prevent injury , rugby is after all a series contact sport but proper preperation leads to much shorter time spent on the physios table. How does this apply to young and not so young footballers ? Well my friend in the academy noted that while the technical and natural skills of the players were of a very high standard their physicality was not and there was a greater emphasis on skill development than on physical development. His colleagues and he have some interesting ideas and plans for our young players of the future. Rugby may not be everyone’s cup of tea but the cross fertilisation between the two games, new and innovative ideas being brought to the table by bright entusiastic minds may drastically reduce the amount of time spent on the recovery table not to mention the numbers of players affected. Certainly Arsenal management seem to think so, l hope they’re right. FIRSTLY THE MEDIC TEAM IS PROBABLY NOT UP TO DATE WITH SOFT TISSUE INJURIES.THEY NEEDS MORE TRAINING,WORKING WITH AN ORTOPAEDIC SURGEON AND LEARN THE LATEST TREATMEMT. OZIL WENT TO GERMANY FOR HIS TREATMENT AND HE WAS BACK SOONER THAN RAMSEY. SECONDLY ,DIET PLAY AN IMPORTANT PART IN RECOVERING FROM AN INJURY AND PREVENT ONE. I REMEMBER WHEN ARSEN JOINED ARSENAL HE HAD A DIET AND VITAMINS PROGRAMME FOR THE PLAYERS.IS IT STILL IN PRACTICE.HE SAID THAT HE DOES NOT KNOW WHAT DRUG THE PLAYERS ARE TAKING OUTSIDE THE CLUB,IT IS HIS DUTY TO FIND OUT AND PUNISH ANY CULPRIT. I DO KNOW PROTEIN SUPPLEMENT PROTECT THE TIRED MUSCLES. OUR PLAYERS SHOULD TAKE A DRINK OF HIGH PROTEIN BEFORE AND AFTER EACH GAME INSTEAD OF SUGAR WATER LUCOZADE. THIRDLAY, YOGA IS ONE OF THE BEST EXERCISE TO PROTECT THE BODY AND MAKE MUSCLE STRONGER, BETTER THAN PRESSUP. ASK R.GIGGS ABOUT IT ,HE IS A GREAT BELIEVER. WE CANNOT FIND EXCUSES OF BAD LUCK , AND WE CANNOT GO ON WITH ANOTHER SEASON WITH SO MANY INJURIES.WE NEED A NEW TEAM OF MEDICAL STAFF.THEY ARE PAID A FAT SALARY FOR WHAT. ?